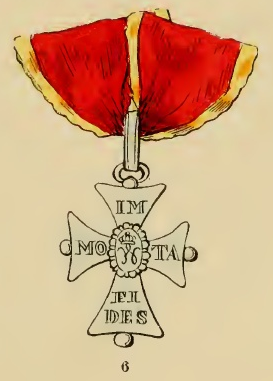 Equal to the Order of Henry The Lion and connected with it, was founded the Cross of merit which is divided into two classes, gold and silver, and is worn suspended by the same ribbon as that of the previous Order, Henry the Lion. Each corner of the gold Cross is filled with a green oaken wreath, but not so the silver. The centre of both contains a W with the crown, and upon the wings are distributed the words,"Immota Fides" (No. 6). The nomination to the previous Order, precludes the wearing of the present cross. 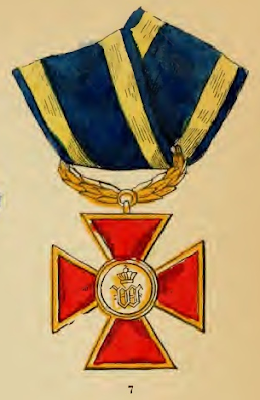 Besides this Order, Brunswick possesses a variety of decorations and medals of merit, mostly military. We give them here in chronological order of their foundation. 1. Waterloo Medal (No. 11) was founded by the Prince Regent of Great Britain, George, as guardian of the minor Princes of Brunswick, on the 1 1th June, 1818, "for the perpetual remembrance" - as the patent says - "of the campaign of 1815, and the glorious distinction with whichthe Brunswick corps has participated in it". 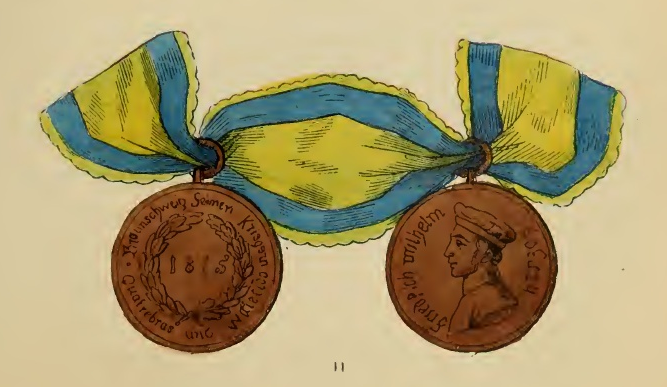 The medal was cast from the captured guns of the enemy, and bears on the front the effigy of Duke Frederick "William, who fell at the battle of Quatre Bras on the 16th June, 1815 ; the reverse shows within a laurel oak wreath, the date 1815, with the legend, "Braunschweig seinen Kriegern - Quatre-Bras und Waterloo" (Brunswick to her warriors - Quatre-Bras and Waterloo). Upon the edge of the medal is engraved the christian and family name, and the character which the owner bore during that campaign, and more especially during the battles of Quatre-Bras and Waterloo. It was presented to all men of the Brunswick corps who had either taken direct part in the campaign, from 15th June to 7th July, 1815, or were present during that period and given assistance to the former, including even field chaplains, &c.
Also the heirs of those soldiers who had either fallen in the field or died subsequently, received in memory of the dead this medal, which is worn by all classes suspended by a yellow and blue striped ribbon about six inches long, at the third button hole, or near it upon the left side. 2. 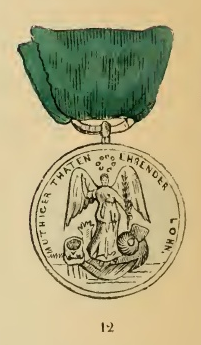 The decoration of Honour for the campaign of the year 1809, (No. 9), was originally instituted by Duke Charles II. on the 30th October, 1824, for the yet living soldiers in the Brunswick service who had followed the Duke Frederick William in 1809, from Bohemia to England; but was afterwards distributed, also, amongst those of them who were no longer in the Brunswick service. It consists for officers, of a gold, and for sub-officers and privates of a bronze Cross, surrounded by a laurel and oak wreath. The year 1809 stands in the centre of the front bearing upon the wings the words, "Für Treue und Tapferkeit" (For loyalty and valour), the reverse shows the Brunswick white steed, and in the centre and upon the wings originally the name, "Karl Friedrich August Wilhelm", and since his expulsion, the name of the present reigning Duke. 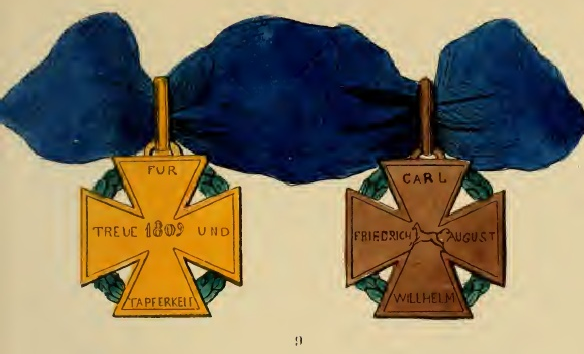 The Cross is worn upon the left breast, suspended by a sky blue watered ribbon. 3. The medal of Honour for the Spanish-Portuguese Campaign, - The troops which came over to England with Duke Frederick William in 1809, formed, it is well known, the nucleus of the contingent which England lent to Spain and Portugal in the War of Independence against Napoleon, and which took part in nearly all the battles fought in the Peninsula from 1810 to 1814. Duke Charles II. founded also for these troops (30th October, 1824) a medal of honour (No. 10), for officers in silver, and for sub-officers and men in bronze. It is worn upon the left breast, suspended by a crimson red ribbon; the front shows the word, "Peninsula", encompassed by a laurel wreath, while the reverse exhibits within a scutcheon, two C's in monogram (the initial of the founder). As may be supposed, the medal is possessed by nearly all the owners of No. 2. 5. The Medal of Military Merit, founded by him towards the end of his reign to complete the former. But as the first was presented only to three civil officers, and the latter only to two military officers, both can hardly be ranked amongst the really existing Orders or decorations. Both medals were in silver, and worn at the button-hole suspended by a sky blue watered ribbon with a very narrow white border. 6. Crosses for twenty to twenty-five years' military service, (Nos. 7 and 8). - This, together with some other decorations connected with it, were founded by Duke William, 1st April, 1833. Officers and military officials with that rank, who have served honourably twenty-five years or more, receive a gold cross with purple red chevrons, the white centre of which contains on the front a W with the crown, and on the reverse the number twenty-five. It is worn suspended by a royal blue ribbon with similar borders upon the left breast. It can only be claimed by those who are on active service on the nomination day, which is the 25th April of each year. The Brunswick army counts now forty-five owners of this decoration. A similar cross of silver was also founded for sub-officers and soldiers for twenty-five and twenty years' uninterrupted and irreproachable service. The centre of the Cross represents on the front a W with the crown, and the reverse the number twenty-five or twenty; it is likewise worn on the left breast by a royal blue ribbon, but with yellow borders. That for twentyfive years service has its centre surrounded by rays. The first twelve oldest owners of the twenty-five years' cross receive a monthly increase of their pay of one Thaler (3s. 6d. ), all the others (not exceeding thirty-six in number) twelve Groschen (1s. 6d.) With the retirement from service the increase ceases. There are, besides, decorations for fifteen and ten years good service, consisting of silver and iron bolts or buckles, and with the same impressions and ribbons as the former. They are equally worn on the left breast. 7. The Saving Medal (No. 12). - It was founded on the 25th April, 1836, and is presented to those who have saved the life of a fellow creature at the risk of their own. The medal is of silver, and contains on the obverse a W upon a scutcheon covered with the ducal crown, borne by lions and surrounded by flags, with the legend, "Ehrenzeichen, gestiftet am 25th April, 1836" (Decoration of honour, founded on the 25th April, 1836). The reverse shows the Goddess Victoria, pointing with her right to a wreath of stars, and bearing in her left a palm wreath with the legend, "Müthiger Thaten ehrender Lohn" (Honourable reward for courageous deeds). The medal is worn suspended by a green ribbon.